Corel has launched VideoStudio Pro X8.5, an update to its VideoStudio Pro X8 and VideoStudio Ultimate X8 apps. The new version makes those packages compatible with Windows 10 and lets you freely access additional movie-making features, including the new VideoStudio MyDVD and NewBlue TitlerEX. VideoStudio MyDVD promises an easier way to burn to DVD, AVCHD and Blu-ray Discs. The app gives videos and photos professional-looking, image-rich menus and music derived from 10 themed templates — complete with menus, sub-menus and chapters. 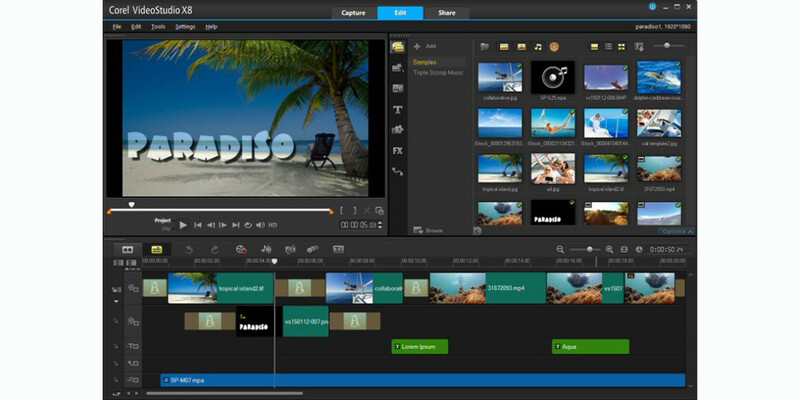 NewBlue TitlerEX lets you add dynamic 2D and 3D titles, captions and rolling credits to your movies. Note that an nVidia graphics card and Intel HD3000 and above required for NewBlue TitlerEX. The update also makes FastFlick, Corel’s slideshow maker, easier to use. You can now find the best part of your video or photo with the new Adjust tool, which lets you choose which part of the video or photo is visible in the template placeholder. Version 8.5 also lets you apply audio filters directly to your video clips without having to split the audio and video first. An audio ducking feature now automatically detects audio and narration to keep your video sound balanced. New overlay objects, video masking, freeze frame and bonus effects let you add more creative touches to your video. The app also supports multiple formats, including XAVC S.
If you’re a newcomer looking to get started quickly, the update provides six weeks of free training from StudioBacklot.tv. The new VideoStudio X8.5 update is available as a free download to registered VideoStudio Pro X8 and VideoStudio Ultimate X8 users. The latest versions of both apps are available for $79.99 and $99.99 respectively.